Invite your friends...and enemies to participate in this exiting game. An inflatable arena completely encloses this adventure. 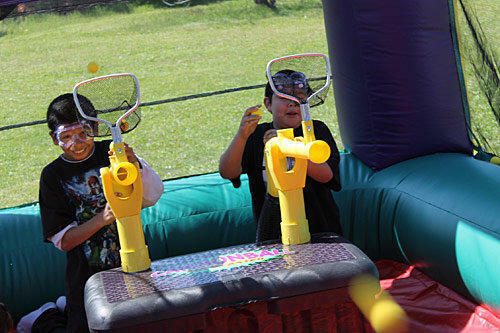 Four air cannons (2 on each end) are set up inside the arena to allow 2 teams of 2 people (4 person game) to relentlessly barrage the other team with foam balls shot through cannons using reverse vacuum technology. This game is suitable for younger kids through adults. Simply feed the foam balls into the cannon and they immediately blast toward the opposing team. A remote control on/off switch for the cannons is available to stop play and allow the next group to participate. This unit is perfect for fundraisers, corporate events/picnics, graduation parties, or backyard birthday parties.